Skin Care & IPL Permanent Hair Reduction. E-mail Club For your appreciation, we offer monthly specials to your email. 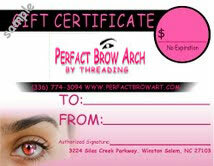 Get a 10% Off Coupon for Threading after you signup for email club. 11th Free Eyebrow Threading Service after you buy 10 eyebrow threading services. No Experation. Buy at salon. Referral Card, Give to friends & family. Get few from Threading Salon.